Item # 314638 Stash Points: 395 (?) This is the number of points you get in The Zumiez Stash for purchasing this item. Stash points are redeemable for exclusive rewards only available to Zumiez Stash members. To redeem your points check out the rewards catalog on thestash.zumiez.com. Show your love for your favorite rap group with the Odd Future OFWGKTA Sticker. Featured in a mostly black construction with vibrant logo script through the center, this sticker boasts a wild yet classic look. 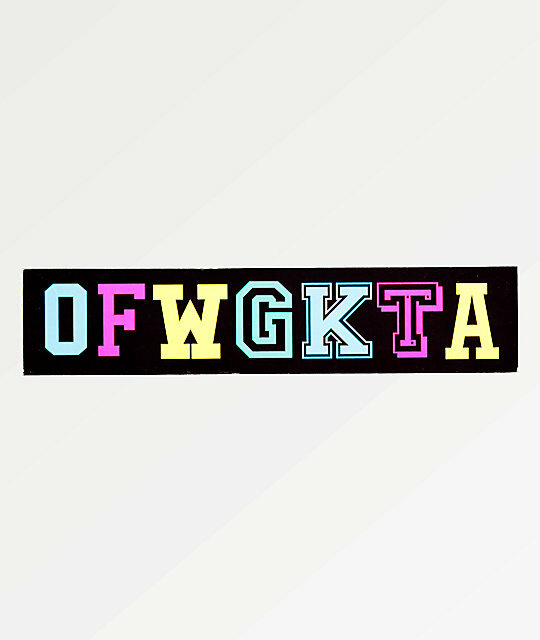 OFWGKTA Sticker from Odd Future. OFWGKTA script logo through the center. 7" x 2" | 18cm x 5cm (approx. ).